address: Santrex Internet Services Ltd. Here are more fake testimonials for the scam site. http://talkonfacebook.com/e-commercetrader.html Hosted by Microsoft's OFFICELIVE. This site contains images stolen from FaceBook Users pages and has links to actual FaceBook users who I am sure have not used this fake site. It appears these scammers have infiltrated eBay's Canadian site to post fake testimonies. Consigning your item with E-ct is hassle-free! You might have a luxury handbag that looked cute at the store but not-so-much now, a high-end bike that you never have time to use, the fancy gizmo from Sharper Image that never made it out of the box. There is so much extra clutter that sits around your house or apartment! Sometimes you just need to get rid of all that extra stuff that takes up valuable space in your place. But you do not have to donate the item or try to take the time to sell it yourself on eBay or Craiglist. You are too busy! Why not let someone else handle all the work and just consign the item? E-ct makes the whole consignment process so easy! All you have to do is clear out your closet, dig through your garage, and hunt in the attic for hidden antiques, designer clothing, luxury handbags, collectibles, high-end sporting goods, musical instruments and high-end electronics that are collecting dust! E-commerce Trader specialize in online consignment sales for individuals, businesses, and non-profit groups. We sell your items for you on eBay,Craigslist and other free marketplaces and send you a check in the mail. Our sales strategy and reputation for selling high quality merchandise, combined with excellent customer service, keeps both buyers and sellers coming back again and again. Our services are available all over United States, Canada and United Kingdom and we plan on extending our business to Europe. Our flagship store and headquarters are located at 1900 15th Avenue West, Seattle, WA, 98119. Our mission is to help the people and communities where our stores are located by providing a fun, efficient and secure way to sell valuables online. 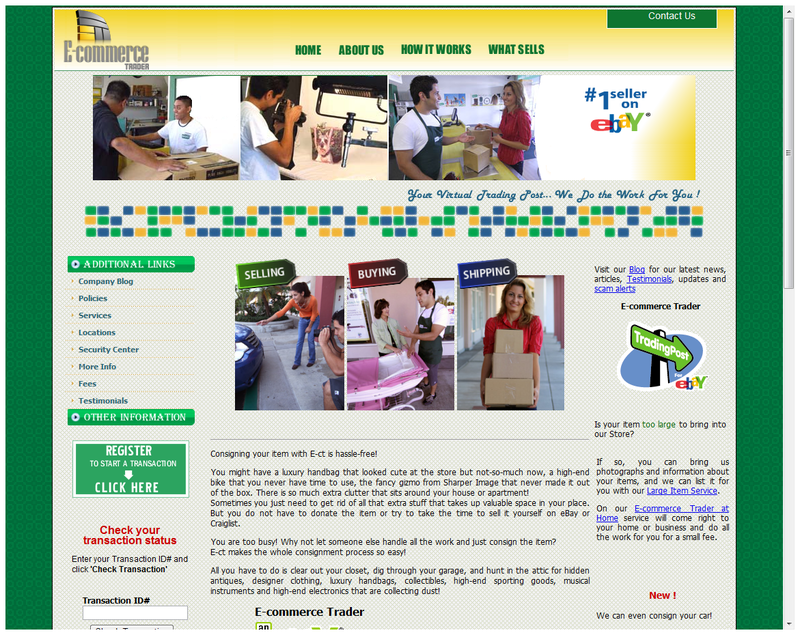 E-commerce Trader sell quality merchandise online in the rapidly growing eBay and Craigslist. As of November, 2009, there were over 211 million registered users on eBay, trading over $1,400 worth of goods around the world every second. 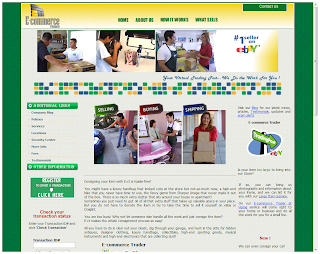 E-commerce Trader specialize in online consignment services for businesses, individuals, and non-profit groups. The original store opened in London, United Kingdom in December, 2008 to help people sell their quality merchandise in the eBay marketplace and later in 2009 we exteded our market in United States and Canada and selling on Craigslist besides eBay.. E-commerce Trader makes it easy by doing all the work and sending the seller a check in the mail. Franchise opportunities are now available for people interested in opening their own E-commerce Trader Stores eBay drop-off store. E-commerce Trader was cofounded by **** and **** in December, 2008. Peter and Erik had both recently finished their landscaping seasons, and and were pondering what the future had in store. They were buying and selling on eBay just for fun when a mutual friend stopped by one day and asked them to sell some musical equipment for him. He offered them a percentage of the sales, and after several successful eBay listings and a few dollars in their pockets the idea was born. 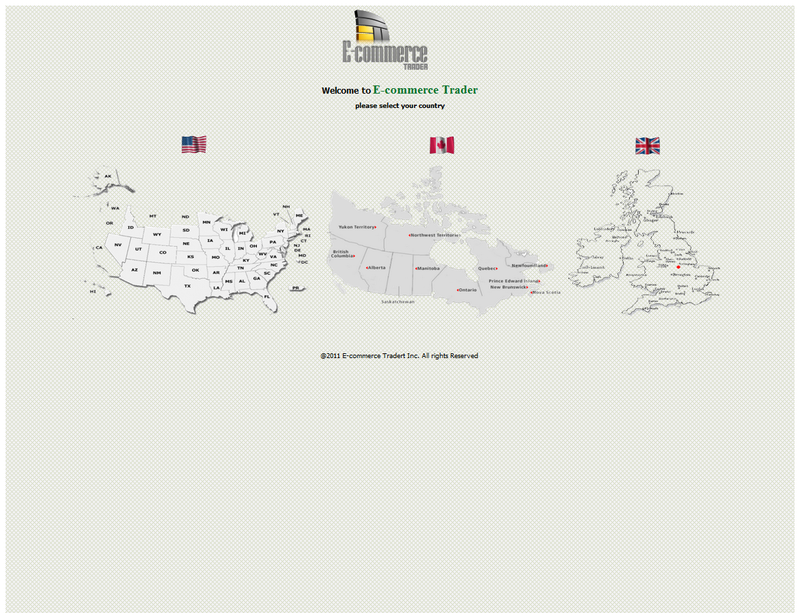 E-commerce Trader was started with a 400 pounds investment and a 10 pounds ad in The Seven Days local weekly newspaper. That first spring and summer every weekend was spent at garage sales searching for items to sell on eBay. Sales and advertising steadily increased, and by the fall of 2009 they had enough people coming through the door to keep them busy around the clock. The Company has now sold millions of dollars worth of merchandise on eBay and Craigslist, and runs one of the largest drop-off stores in the country. In 2009 alone, the Company sent over $250,000 worth of checks to Seattle sellers. The first E-commerce Trader employee, *****, was hired in February, 2009 to write auctions and perform client intakes, and a second employee was added in April, 2009 to pack and ship boxes. Over the year the Company has fine tuned their consignment system, streamlined store operations, and developed a custom software program. The principals have formed E-commerce Trader Stores, LLC to start the process of offering franchise opportunities to other entrepreneurs.